It’s true. Yvonne Craig, the actress who played Batgirl on the campy Batman series of the 1960’s has died. There are lots of sources to find out about how she died, or what she had done besides play Batgirl. Apparently she was in a bunch of Elvis Presley movies and had a long run in other films. She also seemed to be enjoying her later years as well. 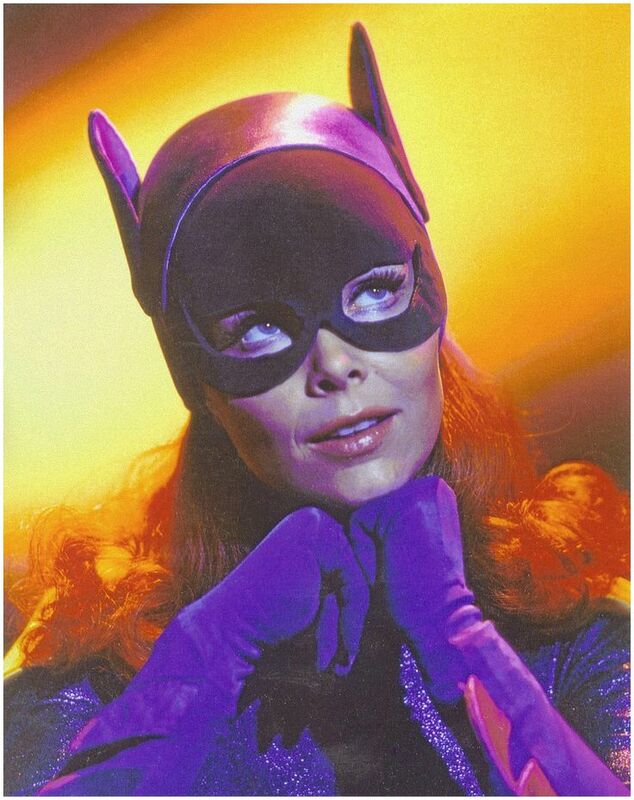 But as far as I was concerned, she was always the Batgirl I saw in 1970’s reruns of Batman. Red wig, skin tight costume, incredibly unable to piece together Batman’s and Robin’s true identities…along with the rest of the world. I didn’t know much, other than she was total eye candy to my pre-teen existence. What I did know is that while Batman and Robin were slugging it out with the bad guys in the fight scenes (always two per hour long story), Batgirl never punched anyone. Never. She would give the occasional kick. But mostly she’d have to rely on her wits. Anything around her turned into a weapon. Just once, I wanted to see her haul off and deck the Penguin or the Joker. It was where we were at the time. Batgirl was the precursor of the modern female superhero. She could be smart and sleek. Just no smacking the boys around. Take a look at what’s going on today. Female muscles a poppin’ in the gym and all over television and the Internet. Rhonda Rousey taking care of business in the ring. The whole definition of female beauty opening up new frontiers. It’s cool to be soft and warm and gentle. And it’s cool for women to have biceps, pecs and glues that could stop the Batmobile in its tracks. I’m glad Yvonne Craig was able to do other stuff besides be Batgirl. She deserved it for kicking down the doors of female stereotypes. Godspeed, Ms. Craig. Have fun in the next episode! Do you have any good memories of Batgirl? Or any other female role models that blazed the trail for today’s superheroes? Comment below. Like, share and Tweet above. The combination of womanhood is my choice. I totally embraced the role of motherhood. I totally agree a woman’s strength is in her wits. My female role model is my mom, she silently worked, endured, and managed. Said very little. Her words were her punch. Thanks for your thoughts on Batgirl, Larry!